3 in 1 Camera Lens -- Multifunctional detachable lens with fish-eye lens, wide-angle lens and 15X macro lens, you can choose different shooting mode according to different need. Surmounting the restriction of fixed camera, bring new possibilities into the smartphone photographs. 230 Degrees Fish-Eye Lens -- The fish eye lens with ultra wide 230 degrees of visibility, captures almost every thing unique round prespective and offers you fantastic image than normal lens. 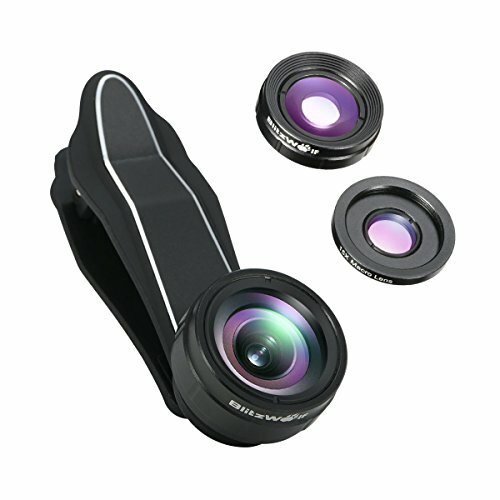 0.63X Wide-Angle Lens+15X Macro Lens -- 0.63X wide-angle lens could easily shoot your whole family or landscape scene. 15X macro lens is ideal to capture every vivid and clear close-up picture, such as, insects, plants and small items. Portable and Mini Designs -- Compact removable lenses and lightweight aluminum frames with the Waterproof lens pouch, a essential portability kit for travel and parties. It tightly clamps on the phone instead of easily move around. High Compatibility -- The universal mounting clamp is compatible with most mobile phones, such as iPhone 7/ 7Plus, iPhone 6/6 Plus, Samsung Galaxy S7, S6 edge, Note 5, etc. Even compatible with tablet PC and laptops.